One of the most challenging sheets to assemble for the East Brighton Seen Exhibition we held in May 2007 was the section on Black Rock. There were SO many similar old postcards that I had difficulty remembering which photos I'd printed and which I hadn't! Printing out page after page of Landslip at Black Rock, I got quite excited when I first recognised the same dog in these first two postcards. One of the postcards had so obviously been hand-coloured and yet the scene it depicted - a chap wearing a flat cap and tie, perhaps a shepherd with his dog - looks convincing. The other view, however, does not! Although it does not appear to have been retouched the man sporting a bow tie and a bowler hat looks a little ill at ease. What's going on? Imagine my delight when Vic Lander brought in this third postcard today. I thought it might possibly be Edward Burne-Jones, as he had lived in Rottingdean for many years. 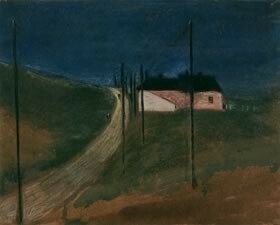 I googled him and discovered a painting entitled Study of a Road near Rottingdean which COULD be the same cottage seen from the east. See for yourself by following this link to the virtual museum. I also followed a link to the My Brighton and Hove website and discovered that Burne-Jones was no admirer of Volk's Daddy Long Legs, which used to run between Paston Place and Rottingdean. Apparently he was pleased when Pioneer was smashed to pieces at Rottingdean by the storm that destroyed the Chain Pier on 5th December 1896. Magnus Volk refused to allow the raging sea to dampen his spirit, however, and he rebuilt the Pioneer. 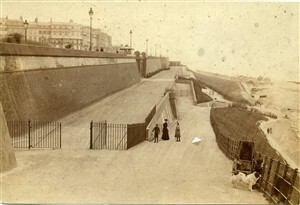 The Daddy Long-Legs resumed its slow journeys to and from Brighton and Rottingdean and remained in service until January 1901. Continuing to search for images of Burne-Jones at work, I came across this site with a number of wonderful old views of Rottingdean and, indeed, Pioneer. And guess what else? You got it - the same dog. Check out this link and scroll down to the 5th image to see which man is holding the lead. August update: at the end of May, I was contacted by a postcard dealer who said she had recently acquired a postcard of the same dog, this time at Black Rock, which she was planning to sell on eBay. In the event the postcard did not sell, so I bought it myself! If you look very closely to the left of the centre, you can just make out a tripod with a chap sitting near it. Could this be Mr Cloth Cap? If it is, it would seem that all of these photographs were taken on the same day, on a journey along the cliffs from Black Rock to Rottingdean, or, as Mr Cloth Cap is sitting down at Black Rock, maybe the journey was the other way around. But when? And why? In an attempt to discover more about the dog (was it perhaps the photographer's own, or his assistant's? ), I visited Step Back in Time in Queen's Road and searched through hundreds of images. 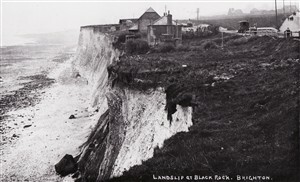 I found these two postcards showing 'Landslip at Black Rock Brighton showing Farmhouse 2 feet from edge of cliffs'. I'm fairly sure this is the same building, but must be earlier because it shows a farmhouse which has gone (fallen into the sea?) before the photographs with the dog were taken. 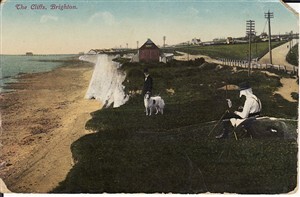 Also, if you look closely, you can see that Roedean School is in the background which would date the photographs at later than 1897. I had recently been sent this wonderful old photograph of the Cowley Dairy which was at Black Rock Farm. 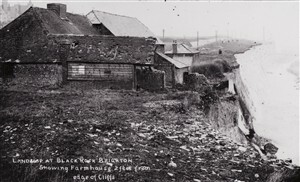 According to John Davies, who has written an extraordinarily detailed historical gazetteer of Ovingdean Parish, available at the East Sussex Records Office, the farmhouse in our photographs is Roedean Farmhouse, built some time after 1824 which slid into the sea some time between 1909 and 1928. If our photographs do indeed feature this farm, then our journey must surely have been in 1909. 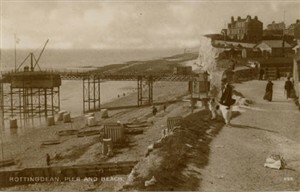 This would mean that the crane visible in the Rottingdean photograph is in the process of demolishing, rather than constructing, the pier. If you look closely at the photos and compare the farmhouse with the Cowley Dairy, you'll notice that the houses are of very similar construction, particularly the roof and the chimneys - one black and white. Possibly the same builder erected both buildings. Or, is it possible that Roedean Farm and Blackrock Farm are one and the same? Describing the Blackrock farm, John Davies writes: "The farmhouse stood on the cliff edge, about 300 metres from the gasometers, in a plot to the east of and adjoining what is now Marine Gate. My earliest record of Blackrock farm is 1839 when Charles and William Cowley were farming and dairying... Blackrock farm disappeared between 1882 and 1909, possibly c1887." Interestingly, I have come across some deeds of another Black Rock farm in East Brighton. William Hallett, who leased a quantity of land from the Marquess of Bristol, built a farm in the mid 1850s. He also built himself a house which he called the Manor House. The deeds show that his farm was called "Black Rock or Manor" Farm, and the name lives on in the Manor Farm estate. But isn't it unusual to have two properties in such close proximity with the same name? 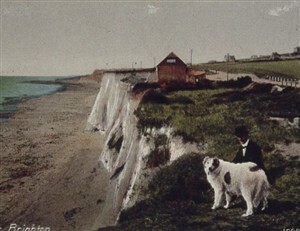 And, finally, do you think this is the same dog in the photograph of Duke's Mound and the Kemp Town enclosures? Or was this the final photograph taken on the same journey? We'll probably never know, but it's been great fun trying to find out! My Great Great Grandparents were married in 1861 at St. Nicholas Church, Brighton. The bride's father is shown as the Butler at Manor Farm. And I have some old family notes which link this to the Hallett family! I wonder whether any records still exist? I would be happy to contribute any details which would be of interest. I am related to the Hallett family and believe that Frederick Hallett lived at the Manor Farm at this time. I know William Hallett his Father died in the year 1862, he was my 3x G.Grandfather, any information about the family would be very helpfull in my research. My great uncle, John Miles, married a Mary Maria Cowley. 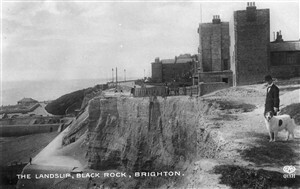 Who I understand was connected to the Cowley family of Blackrock/Rottingdean. John and his father before him, lived and worked at Bristol Nursery, Bristol Gardens, Kemptown, Brighton. The Miles family leased the Nursery from June 1865 to some time between 1891 and 1901. William Hallet had married a Mary Ann Miles but I have yet to find a connection between her and my Miles family. I'd love to hear from you Sheila as I have been working on the Hallett family over the last week. I have a copy of a marriage certificate for two of my ancestors who were married at St Nicholas church in April 1857. The groom was Benjamin Barber a butcher from Baker St., and the bride was Lucy Marchant. Her residence was given as Black Rock Farm Kemp Town and her father John Marchant was listed as Farm Bailiff. Does anyone know if this farm was on the cliff edge or have any infomation about John Marchant? Your item interests me. I visited Brighton in the 1990's checking for Harrington Farm as I am a descendent of the Cowley Family through the marriage of Kate Cowley to Thomas Priest Maddams. My understanding is that Cowley Dairies had 2 shops in Brighton and sold out to United Dairies about 1935. I have a rather feint photo taken in 1970 of a water colour of Cowley Farm Rottingdene painted in 1924 on the edge of the cliff with two high chimneys, and some yards from it inland a lane on the otherside of which is a cottage. In front of the two high white chimneys at the end of one building is a low single storey building with a blue framed window and red tiled roof. In front of that is a large green field and in the foreground is a hedge with two figures which look like women Where the hedge joins the lane and in front of them looks like an allotment or vegetable garden. 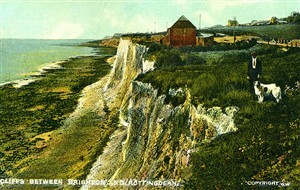 The cottage and lane are on the left of the painting, and the cliff edge and sea on the right with several white cliffs in the distance. Some from census sources, and some from family knowledge, letters, local history in Sussex, and from the Mormon records in London. m about 1824 Mary Ann ? 6 Kate Elizabeth Cowley b 05.12.1854 buried at Ashwell. Herts They had 7 children. One of theirgreat great grandsons is a Dairy herd stockman near Ely. 6 Charles Cowley bp 29.06.1856 3 Triplets or were they all baptised same day. 4 Thomas Cowley m ? m about 1805 Wife unknown. Frederick John Cowley son of John and Laura Cowley baptised at St Stephen's Brighton July 28th 1872. Black Rock Farm My sister has a watercolour of Black Rock Farm. Our father Frederick Holford was born there. In the 1901 census it was known as the Old Tar Factory which fits in with the location near the gasworks. I can email a scan of the picture if you like. The most recent postings by John Maddams and Chris Holford are of great interest to me. 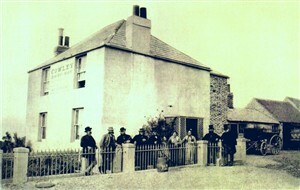 I have a Cowley family history web site at www.cowleyfamily.org.uk and you can see many of the 'Brighton Cowleys' back to the early 1700s. I do have a lot more information to add to the site when time permits, particularly links to the dairy farming side of the family. If anyone would like to contact me and share information please do so via the web site. Hi would you have any information about William or any of the Cowsley / Cowley that might have gone to Burma. Also I was told by my father that ( S ) was added in Cowsley. Could you please let me know. Waiting your reply Lynda. I am studyind a bag seal (lead seals attached to all kinds of produce in the 17 & 1800's) that has the inscription FREDERICK F. HALLETT around the outer border of one side and BRIGHTON across the middle. The other side has TRADE PEDIGREE MARK in three lines across the middle and the strange inscription GENEALOGIOUES CEPALES around the outer border of that side. Has anyone any ideas of the produce it was attached to and the industry? With regard to the seal with Frederick Francis Hallett's name on he was a farmer of Wheat and Barley at Manor Farm Brighton. see- www.orpheusweb.co.uk/john.rose/ttech.html he was my 3xs G.Grandfathers 2nd Son, his father William Hallett, was 2nd Mayor of Brighton , JP and Alderman and built the Manor house in Brighton, but lived on Marine Parade, hope the website helps.